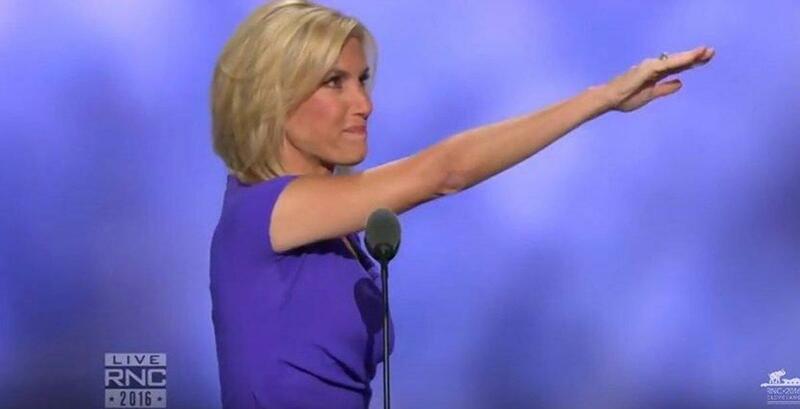 Never doubt the ballistic factor of Laura Ingraham. Ingraham is never into facts, which tend to be the unwanted gate crashers of her party. What matters in that particular world view is sentiment, often tinged by viciousness. In so far as it matters, she is the great weapon that someone like Trump needs: intangible, but feeling; vicious but at heart sincere about her prejudices. In truth, the most prejudiced are as sincere as the great idealists. Fascinating as it is to use such terms as phony and corruption for a man who made bankruptcy an art, and reality television a supreme art, Ingraham plays the tune that will prove dangerous to Hillary. This mocked convention, filled with indignant ennui, suggests that Trumpism is thumping, a fist of history that intends to make a mark. But he has lacked a spokesperson for his movement, thinking himself the best one for the job. Hence the performance by Ingraham, who “out-Trumped Trump” (Vox, Jul 21). On Wednesday, a convention that seemed to be whirring rather than raging received the radio host’s fire. The burning themes have become matters of a more global nature: the fear of the ever uncontrollable without (refugees); the fear about the terrifying within (terrorists and radicalisation); and notions of dispossession (the country needing to be taken back). The larger than life target was always going to be Hillary Clinton. As the GOP Chairman Reince Priebus suggested to attendees on Thursday, “Americans have had enough of corrupt deals.” Clinton was prone to read ethics manuals as closely as Americans perused their junk mail. She had perfected politics as an exercise of self-enrichment. This is a wave that has been declared by various scribblers as Trumpism – or some such. Dominic Tierney is convinced that Trump is riding one. (What came first? Wave? Trump?) The issue is hardly that relevant, pointing out to a figure who has managed to raid the warehouses of discontent. Globally, estranged voting publics are turning the tables on the smug and complacent, the decision makers perceived as coolly distant and self-interested. A populist machinery has been developed to plough the fields of dissatisfaction. One of the members of that machinery was an important figure behind Brexit, Nigel Farage. To make a point, he made his way to Cleveland to witness the GOP convention. He had little reason not do, having done his dash with a successful campaign, yet refusing to serve in any capacity on deal with the aftermath. For Farage, an emotional and symbolic reclamation was taking place in a more international sense. As he explained to his US audience, “June 23 is our Independence Day.” It was the day that the country was retaken, pride regained. As for Trump, it was “irrelevant that [he] was rich, if he is able to go into these communities and to have conversations with those people so that they feel he actually gets it.” The establishments across Europe and the United States did not. A fine illustration of the point came from The Economist, whose editorial on Trump (Jul 16-22) did not see a US in crisis. This was the great example of establishment chat: the rage was misguided, the angst misplaced. There was the “gloomy rhetoric” amidst positive economic performance (“the fourth-longest” recovery on record); there had been “huge progress” in the field of race relations. It was Trump who had “done most to stoke the national rage”. It may be going one analytical step too far to suggest that Ingraham had given inchoate Trumpism form. Sentiments do not have any, and pure anger without concerted meaning is simply a feeling in search of action. But the movement that has come to bear his name will continue. Beyond the personality cult, which Trump can only do so much to control, is a firestorm that has every prospect of becoming incendiary.